Rod at bay: both cuts of this double-A side find Stewart on the defensive, licking wounds inflicted in failed relationships. The subdued, pretty, “I Don’t Want To Talk About It” is much the more effective (even if its clumsy heart-heart rhyme grates), rambling effectively and reminding you that the lothario is at his most dangerous when cornered. It hardly sounds like a No.1, and would work better without the guitar solo or that odd tacked-on key change, but it’s grown on me and I could take another helping or three of that gentle acoustic picking. “First Cut Is The Deepest” doesn’t work nearly so well. It relies on you buying Rod as a bruised ingénue on the rebound, which is tough going on impossible. 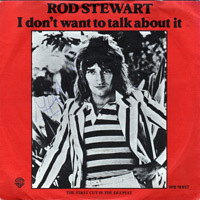 The problem with Rod is always one of credibility – right from the start of his career he wrote himself into his songs so indelibly that I’m always prodding his tracks for believability in a way I’d never do for most of his peers. “First Cut” sounds weatherbeaten and cynical, rather than freshly hurt, and it doesn’t help that it’s such a middleweight plod of a song. I don’t recall which side was the more played but ‘First Cut..’ is by some margin the worst offender here. A lazy vocal and soporific band performance do not ‘sell’ the song for me. I wasn’t familiar with the PP version of the song so could make no comparison, I just knew that Rod’s version sucked big ones. ‘I Don’t Wanna…’ however, is an ok song and one that has grown on me over time. In 1977 though I would have viewed both about as welcome as a trip to the dentist as their pedestrian pace would have seemed to slow to a crawl with the imminent arrival of a certain royal salute. It beggars belief how Rod clung to the top an extra week (or weeks) when he had already outstayed his welcome so hats off to Auntie Beeb for ensuring Liz’s parade wasn’t reigned on. All this conflict! Aren’t we ready to show that we can come together and think like one? Just put your trust in me – I’ll try not to let you down. hated the EBTG cover at the time (unaware it was a cover back then) but now I´m quite fond of it/the song generally. most strange. now wondering what motivated EBTG´s decision to cover it incidentally. I’m sure if money was all they were after they would’ve covered Typically Tropical. And they certainly could’ve done with a bit more sun. Pretty much alone here but I find Rod’s “First Cut” thrilling and can listen to it over and over. The note of weariness is perfect for the song. Re 5/6: Pale imitations of PP Arnold classics lacking vim and vigour? We ain’t seen nothing yet on Popular.